Christmas means A Christmas Carol, Charles Dickens’ 1843 novella about a night in the life of a miserly London accountant who is visited by holiday spirits. This year, Seattle Musical Theatre is putting on an adaptation of this winter favorite, titled simply Scrooge the Musical. The show features a huge cast of enthusiastic singers young and old, and their lively, bustling ensemble numbers really bring the world of the play to life. The scenery was also wonderful. Inspired by a black and white etching from an early Christmas Carol publication, Director/Designer Steven Fogell filled the performance space with multi-story buildings done all in black and white, each opening and closing like a dollhouse to reveal another room inside. Their grey palate not only reflected the poor conditions of Dickens’ industrial England, but also gave the production a neat gothic-chic feel reminiscent of the work of Edward Gorey. The sets also made the colors of Dodirose Zooropa’s rich, Victorian-style costumes really pop. Though the scenery was engaging and the performers had a lot of heart, the show’s book, music and lyrics were not nearly as compelling. No stand out tunes left you humming or hoping for more. The overall pace of the show tended to drag, and the comedic bits were not sharp enough to fully elicit laughs. Ebeneezer Scrooge, that famous protagonist who loves to hate, seemed much more inconvenienced by the ghosts than haunted, and therefore his redemption fell a bit flat. There are bright spots in the play, such as the performances of Loretta Deranleau Howard and Eric Hartley as the Fezziwigs, McKenna Turner as Scrooge’s lost love, Isabel, and Kate Sumpter as the ghost of Christmas past, but there is potential here for much more, too. Scrooge the Musical. Book, music and lyrics by Leslie Bricusse. Directed by Steven Fogell. Music Direction by Josh Anderson. Choreography by Joanna Hardie. 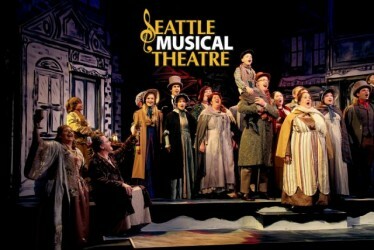 Seattle Musical Theatre at Magnuson Park, 7400 Sand Point Way NE, #101N, Seattle. November 16 – December 9. Tickets and information at www.seattlemusicaltheatre.org or 206-363-2809.